Take a flight from HYD at 11:00 Pm. Reach SIN at 06:10 Am. Take a flight from SIN at 09:20 Am. Reach Hanoi Airport at 11:40 Am. Welcome to Hanoi – the capital city of Vietnam. Arrive in Noi Bai International Airport, your driver will be waiting there to take you to your hotel in the city center. The rest of day is free at your leisure. *Additional Water Puppet Show/ Cyclo Tour/ Street food tour is available on your request. Overnight at the hotel. After breakfast Enjoy a full day to discover the Halong Bay on Land! This morning, drive to Ninh Binh and enjoy the boat trip on the emerald water of Trang An Complex to discover the caves. Trang An Landscape Complex is a spectacular landscape of limestone karst peaks permeated with valleys, many of them partly submerged and surrounded by steep, almost vertical cliffs. Trang An is recognized as the World Cultural and Natural Heritage site. Lunch is at your own choice and expense. In the afternoon, visit Hoa Lu – the old capital of Vietnam and Bai Dinh Pagoda – the largest pagoda complex in Vietnam! Get on a electric buggy to get deeper into the complex. Take few steps to reach the main building and the tower overlooking the Red River Delta. . Overnight at the hotel. After Breakfast Getting on a 3-4 hour journey to Halong Bay – a natural world wonder. You spend a night onboard an elegant junk, cruising on the emerald water to the far and less touched areas of Halong; it is a lifetime experience that you will never forget! Arrive at the dock around noon and then you will embark on the cruise, followed by a delicious lunch while the cruise . sails further to the secluded, island-dotted bay. You will join the cruise’s activities such as visiting cave and sandstones mountain, kayaking…At night, relax on the sun deck or go squid fishing Overnight at the hotel. Morning after Breakfast Wake up early and take advantage of the early riser to capture the most beautiful moments of the bay during sun rise then attend a Tai Chi lesson with other passengers. Light breakfast is served with pastries and coffee while your cruise continues sailing through the islands. Depending on each cruise, you may visit nearby islands in a row boat then navigate back to the Halong jetty. Transfer back to Hanoi later this day. Overnight at the hotel. After breakfast Check out from hotel. 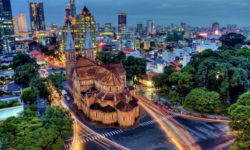 With its wide tree-lined boulevards, French-colonial buildings, peaceful lakes, oriental pagodas, and warmhearted local people, Hanoi offers a timeless charm that people will definitely fall in love with. The tour includes visits to main sites as the Ho Chi Minh Complex, Temple of Literature – the first university fo Vietnam, Old Quarter, Sword Lake. Conclude with Dong Xuan Market where a varied goods are sold. Free time to shopping until transferring to the airport for your flight back home. End of services!. Take a flight from Hanoi at 04:05 Pm. Reach Bangkok at 06:05 Pm.Take a flight from Bangkok at 08:55 Pm. Take a flight from Mumbai at 03:00 Am. Reach Hyderbad 04:25 Am.